Pics of bikerack on Jimny's please? 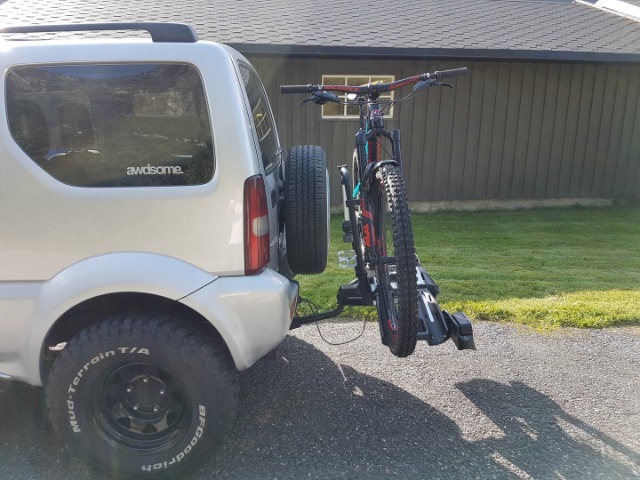 Ive seen some pics of towbar racks, which a bike hangs on to.. They are ok enough for standard bikes, but not for todays mountainbike frames, especially in carbon. Anybody got pics of some bikeracks either on roof, or rear, where the bike stands on its wheels instead of frame? Pulling off wheels to shove the bike inside the car gets old veery fast, especially when going home with a dirty/wet bike. 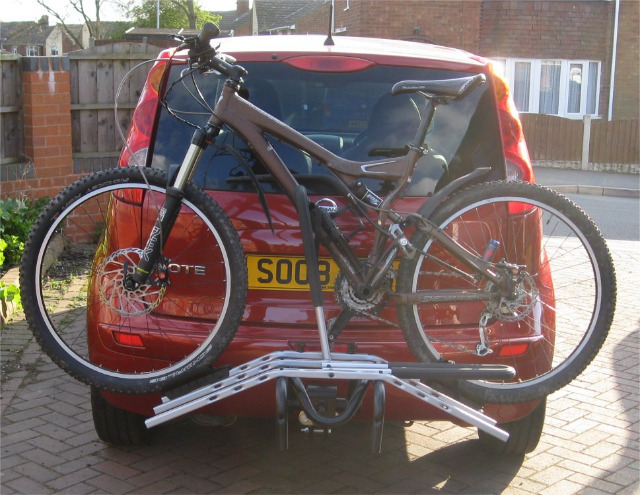 Replied by facade on topic Pics of bikerack on Jimny's please? Here is a Thule 3 bike (in their dreams, not 3 adult bikes that's for sure ) on the Renault Nee-San, Notice how the wheels stick out miles. It works on the Jimny if you throw the spare wheel away, I did modify it by moving the pivot point for the frame (there so the frame cracks in half and drops the bikes down so you can get into the boot on a car where the boot lid somehow goes forwards as it opens, not one where it comes outwards) but it seemed frighteningly long. 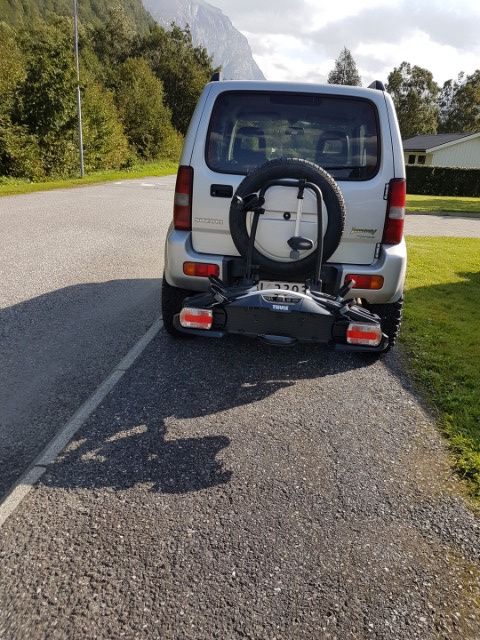 I've never fitted it to the Jimny, even though I bought it for it , I just take the front wheel out and throw the bike in the back of the Renault Nee-San and use that as it is miles easier and quicker. 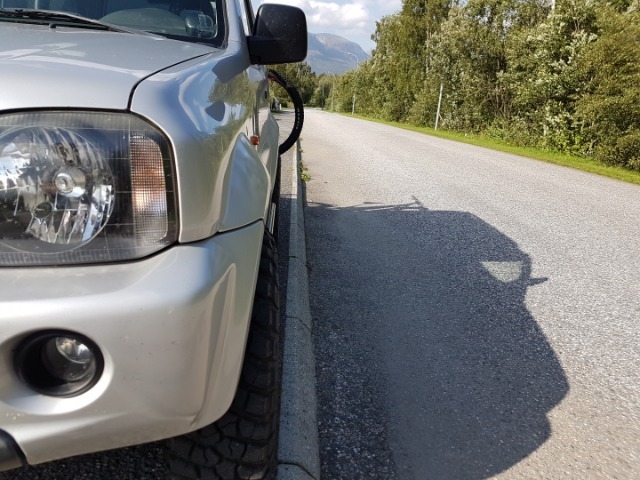 You would also have to weld the thing to the towbar, and the towbar to the car if you expect it to still be there when you get back, or detach it and store it in the car. They do sell a Mickey Mouse "lock" that looks a waste of money. 2) One of my friends parked his on a carpark with a height barrier which chopped the bikes & rack off the roof. Last edit: 31 Aug 2018 13:17 by facade. 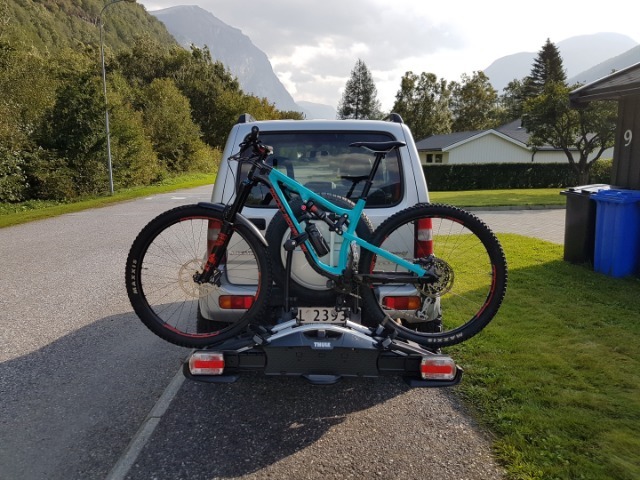 Replied by OlaGB on topic Pics of bikerack on Jimny's please? Hmm yeah, that towbar rack could do the job..
And im not afraid of it being nicked of the car in my area.. But daiuum they are going to look big, on that little Jimny. The bike is way too expensive to take chances.. I did think of fixing a couple of the roof carriers on top of a little trailer, which would be great, easy to load them on, less chance of forgetting about them and knocking them off, but you end up with a trailer, and it is still easier to drop the front wheel out and put one or even two in a car that is long enough. When I had the Landrover pickup, I bolted 3 bike carriers in the back, and with 3 seats in the cab I could drive 3 bikes and riders anywhere. Last edit: 31 Aug 2018 16:23 by facade. 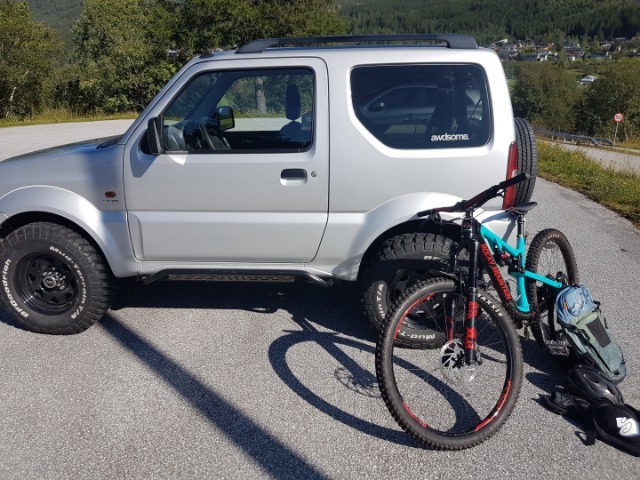 Replied by florinelu07 on topic Pics of bikerack on Jimny's please? Last edit: 03 Sep 2018 12:03 by florinelu07. Even it being a more expensive route, i think ill go for a Thule Velocompact 2.. Seems to be the most practical and safe solution for my use. Replied by Busta on topic Pics of bikerack on Jimny's please? I strap mine to the spare wheel with a couple of cam straps. I've done it with dozens of different bikes now, and covered a lot of miles with no issues. Busta wrote: I strap mine to the spare wheel with a couple of cam straps. I've done it with dozens of different bikes now, and covered a lot of miles with no issues. It´s a £5k+ bike with carbon frame, so i dont want to take my chances.. 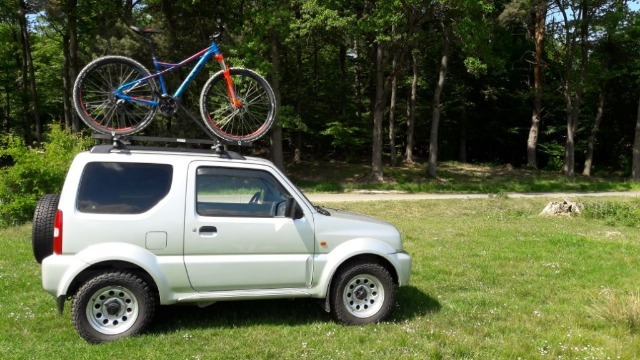 I was just looking for how the jimny will look with a huge bike rack basicly , and now i know.. Roof rack looked a bit, strange, and the rear rack will also look a bit huuge, but yeah, i can live with it. Last edit: 04 Sep 2018 19:38 by OlaGB. Looks a posh version of mine, you will have to take spare wheel off, and maybe the carrier as well if you want 2 bikes on it. If it is nice at the weekend I can dig mine out and attach it to the jimny, it has been on, but I took one look at it and took it off again, wish I'd taken pictures at the time. Yeah, yours is probably a bit older, dont think they make it anymore..
My towbar is like 10ft long (ok, maybe just 1ft), so i wont be suprised if i can keep the spare wheel on.. But i have no problems driving without it anyway. Some pics to complete the thread..
Works perfect, could not be more happy with it! This last pic is with the rack lights pushed all the way in.